We left Butrint wishing we could stay a few more days, but already a few days behind schedule, we wanted to make good time through the rest of Albania. The country is only a few hundred kilometers from the southern to the northern border so we were hoping to manage to get almost to Montenegro that evening. After lingering in Butrint for a bit longer than planned, we were flustered as we drove away from the ancient city and into Albanian modern life. We were in search of a map, which didn’t see readily available. We stopped at gas stations and small markets hoping they might have one, but no one seemed to know even where we might find such a thing. The roads didn’t seem to be numbered and the signs that announced the presence of cities in particular directions at intersections were inconsistent and seemed screwy at best. A few times we followed a windy road hoping it would lead us to Sarande, a port city in the right direction that held the promise of a city center large enough to have a store with a map, but we had to turn around when none of the signs along the way assured us we were on the right track. 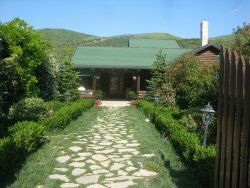 Finally, a few U turns and a lot of grumbling later, we started to see the high-rise luxury style apartment buildings and glimpses of the coastline that we had been told by the Americans in Butrint would be a sign that we were approaching Sarande. The town was very quiet and the city center never appeared, only twisty, one way narrow streets that crisscrossed the cliff like coast that the city sat atop. 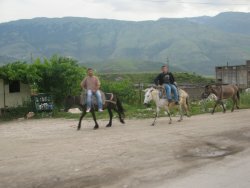 We got lucky enough to stop for directions in front of a small tourist shop selling T-shirts and Albanian knick knacks. Just as we were readying our gestural energy to approach the women at the counter, Molly exclaimed with joy, “A map!” And there they were, maps lined up on a metal rack waiting to save us from our cranky, off track afternoon. In the car we tried to make sense of the map on the rack that we had deemed the most clear and hopefully accurate and consequently purchased. 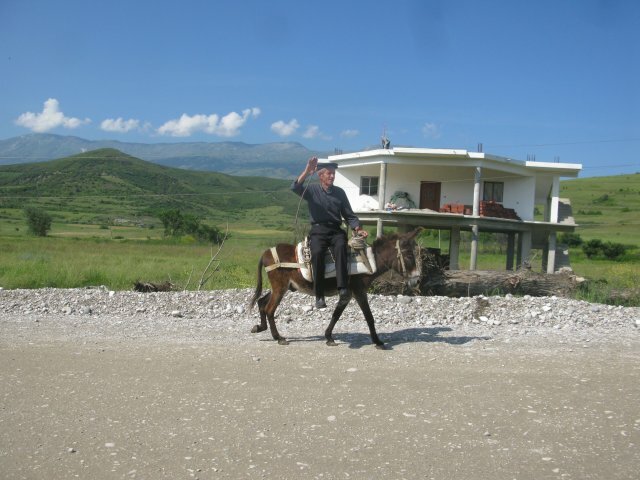 There was one long red road stretching up through the length of Albania, directly in the middle of the country (running south to north) and a few turny-twisty blue roads climbing their way up the coastline. We had been warned about the coastal roads—hair pin turns and death defying inclines all with the comfort of a sharp drop off to one side. The bus with it’s iffy brakes, inaccurate steering, and menopausal tendencies toward hot flashes, had voted for the main highway. And we agreed whole heartedly. So the red road it was, but how to find the red road from our current location caught in the web of Sarande’s tangled streets? We tried a few larger looking roads, drove for awhile, but after not seeing any signs for cities that were on our way, stopped to ask a man sitting outside a small market. Choosing a city north of us on the right road, we stopped and made our best questioning faces, “Gjirokaster?” Point, point, point (in various directions), palms toward the sky with an exaggerated shrug. 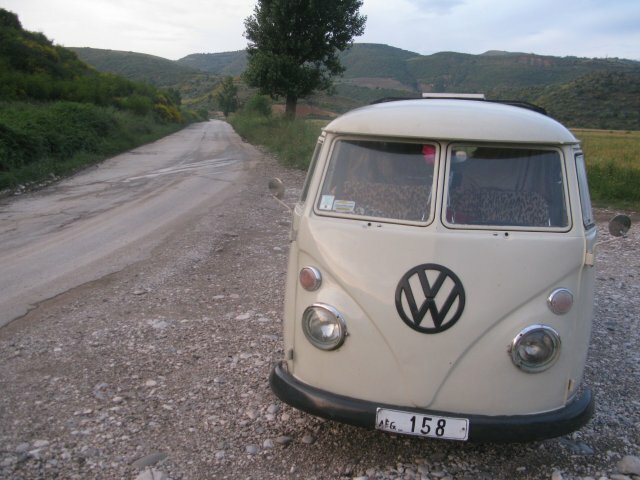 Molly offered the map to the man who was now standing by the combi’s passenger window. He was not interested in the document we had spent the last hour and a half searching for furiously. “Oooow,” he said and then made a gesture which seemed to indicate that we had to turn around. The man then made a few karate slices through the air in the opposite direction and we understood we had to turn around and continue straight. 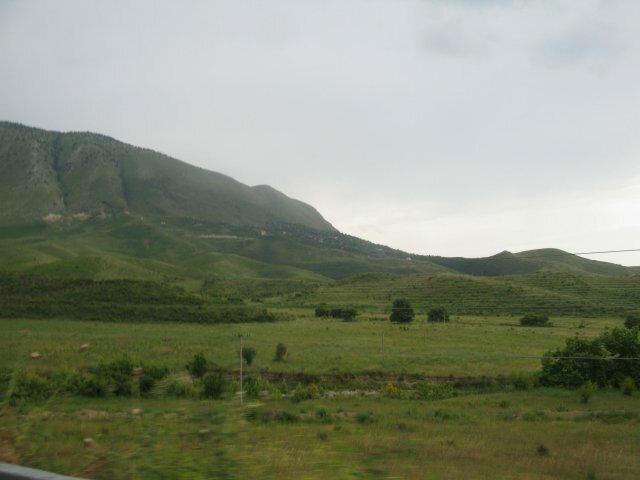 So that’s what we did, patiently driving and driving on a road that took us out of Sarande and then just kept going. There was no sea to remind us we were on the right track, and none of the signs that named various places seemed to correspond with anything on the map. We drove with our nerves feeling as jumbled as the roads—already off schedule, with a late start for the day, and now this uncertainty. Were we even going in the right direction? We stopped again. The man smiled and used his whole hand to point down the road which we were traveling along. For some reason we didn’t feel well assured, but we kept our pace of 50 km an hour, though the road itself kept shifting from almost acceptable pavement to dirt and rocks. How could this be that uniform, straight, thick red line that so easily cut through the country on the map? We grumbled a bit more. Then the sky grumbled back. It had been darkening slowly over the last confused hour, but we had been occupied with other things. Drop, drop, drops started to make our day a bit worse. 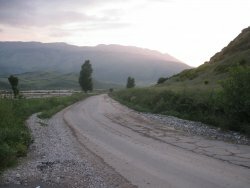 The road narrowed and was clearly heading for the mountains. Then it ducked into forest and started to wind it’s way up. We got out the detached windshield wiper and readied ourselves for the tedious game of drivable visibility in the rain that combi liked to play with us. Up around, around, and up. The road just kept turning and doubling back on itself. Finally, slightly obscured by the thick foliage, we spotted a sign that said “Gjirokaster 45.” We looked at our map, the red line between Sarande and Gjirokaster when measured between thumb and forefinger and compared to the kilometer key to one side looked to be about 20 kilometers at most. It also looked straight as an arrow and smooth as a baby’s bottom on the map. 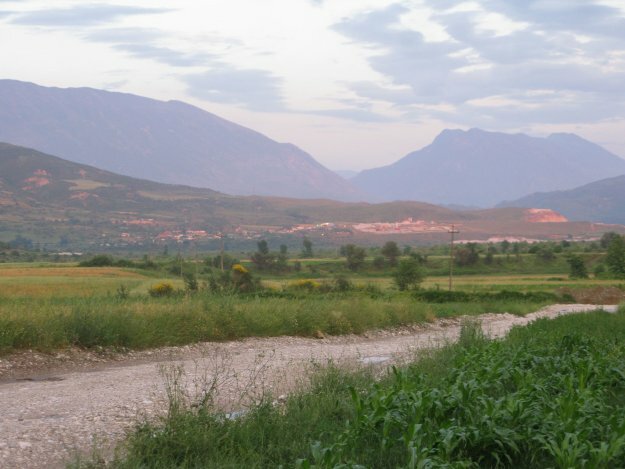 We wondered over and over whether we were on the right road, the main road, the highway road, the only road that looked like it cut through the lower part of Albania. It was the scores of passenger buses and freight trucks that were snaking their way along the road ahead and behind us that answered the question. This must be that main road we saw so clearly on our map because if there was an alternative route our co-drivers would be on it. So we drove through the rain and forest wiping the windshield out the window, trying not to get carsick on the hard S curves. We were so cranky that we almost missed the stunning view that emerged when we popped up out of the tree line and realized we were high up on the side of an enormous mountain. It took 3 hours to drive the 45 kilometers, and by the time we found Gjirokaster, it was 5pm. Then road did run straight and flat for an hour or so and we settled back into the calm, normalcy of our westerner assumptions that roads are always taken care of and are the basic right of all drivers everywhere. 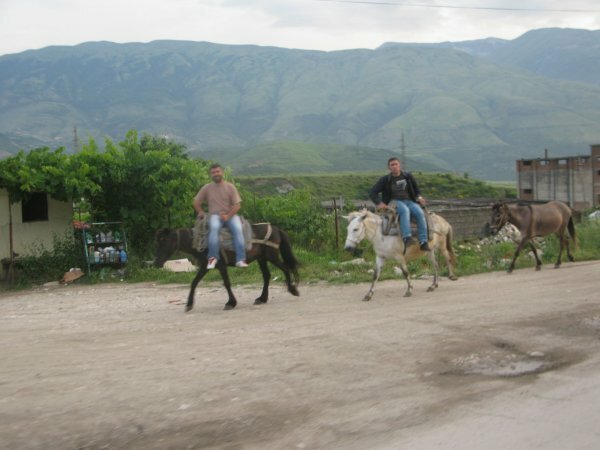 We knew that we’d lost some time riding hairpin turns on the extra kilometers the map forgot to mention and that meant that we would definitely be spending another night in Albania, but it seemed all was going to be well and we’d only really lost a couple of hours. 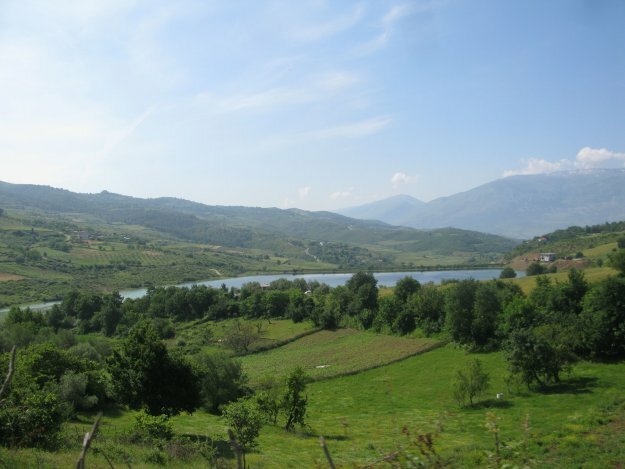 We decided to go to Fier (a city in central Albania) and spend the night there. 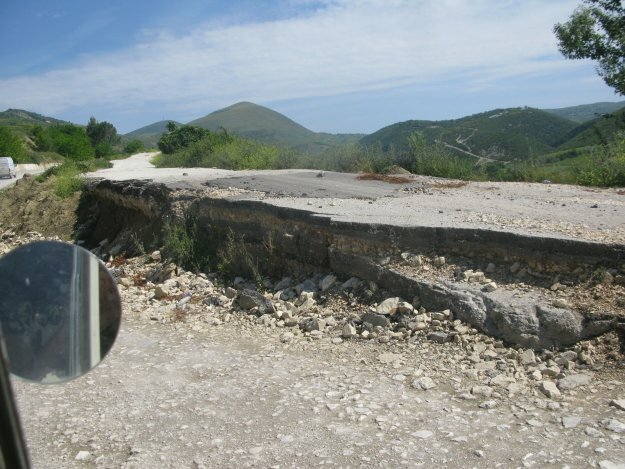 But the gods of Albanian roads were not smiling. They didn’t find our privileged attitudes the least bit amusing and somewhere just 50 kilometers north of Gjirokaster the pavement fell away to scattered stones and dirt and we recognized that Fier was slipping out of reach, along with the sun which was slipping down toward the horizon. Bad headlights and bad roads are not a good combo. Mix in a hungry, disgruntled traveling husband and wife team who planned to have this country behind them by sundown and you’ve got a recipe for disaster. We decided to stop for the night. Luckily there was a little tavern restaurant that appeared just minutes before the incumbent meltdown. So we parked, ate and drank ourselves silly for under 10 Euro and sighed with relief. Then we did the dance of moving paintings and various other supplies from the back of the bus to the front seat and snuggled in to sleep for the night. The next day was 14 hours of driving through the most amazing countryside with the worst roads that either of us had ever seen. 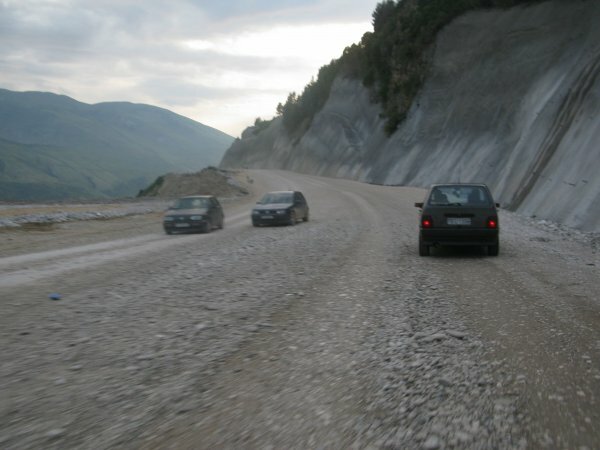 Even Afghanistan has nothing on Albania when it comes to roads. If it hadn’t been some of the most beautiful views and sights that we had seen so far, we would have been miserable. 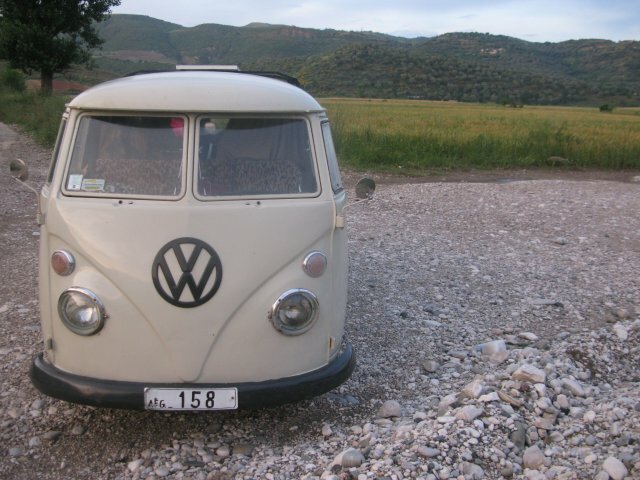 The combi kneeled and hopped into and over all sizes of bumps and holes. The road seemed to favor mountains so we climbed and descended over an over, marveling at the fertile farmland that covered every inch of mountainous surface, some orchards and fields so steep we wondered how people didn’t fall sideways out of the trees when they were picking the fruit. 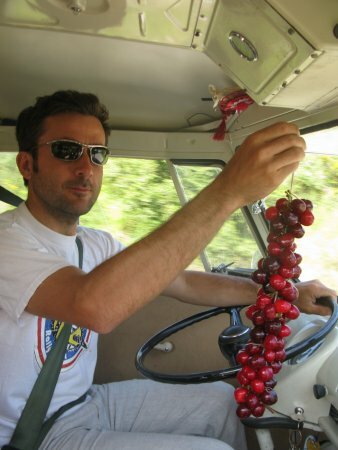 And there was lots and lots of fruit to keep us happy as we got a long, jostled view of the scenery through all those VW windows. Boys on the sides of the roads were selling woven ropes of blushing red cherries and peaches and apricots. 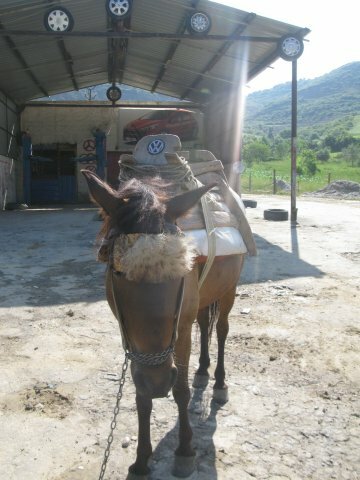 We also discovered that people in Albania ride their horses side saddle for some reason. 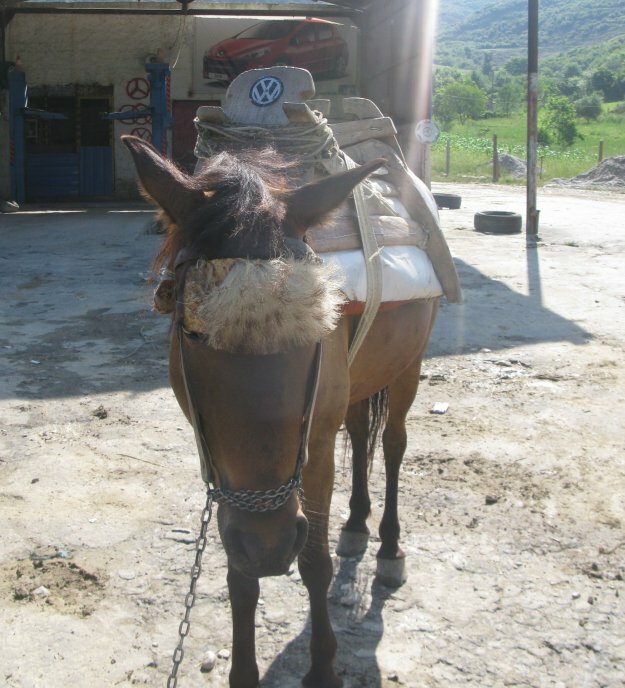 And best of all we saw a Volkswagen model even older than ours. . . 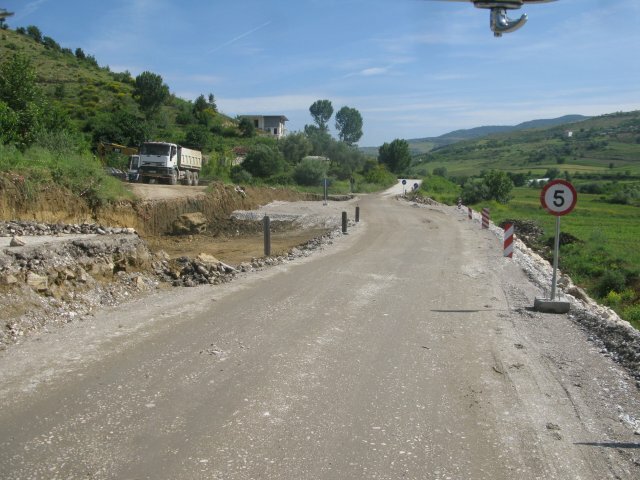 But when we reached the ending stretch of Albanian road that was to take us to Montenegro and found it paved and easy, we almost cried with joy.